La Piedad is in the Mexico state of Michoacan and located north of Zamora. 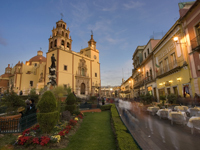 The city is adjacent to the southern border of Guanajuato. The La Piedad Phone Book is one of several phone books that cover Michoacan. The La Piedad Phone Book contains both Yellow Pages and White Pages. This telephone directory includes several cities in the northern most part of Michoacan. in La Piedad with Mexico Yellow Pages and Whites Pages.